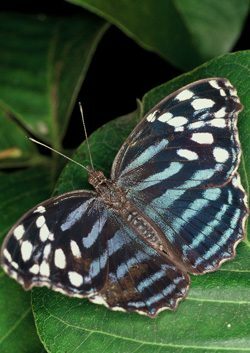 The Blue Wave, Myscelia cyaniris, is named for the bands of iridescent blue across the upper wing surface. The underside is extremely camouflaged in gray and brown, resembling bark. This butterfly, like the Morpho and Owl Butterflies, visits fermenting fruit rather than flowers to feed. It is found from south Texas through Central America.